In northern climes, cooking vegetables in the winter can get a little dull. For someone who tries to keep to seasonal vegetables, in the months when nothing is growing outside, the choices are mainly root vegetables and various crucifers. As much as I love most of these vegetables, especially roasted, I can also get bored. One of the percs of cooking with the Cottage Cooking Club is finding inspiration in the seasonal selections made by our leader Andrea, The Kitchen Lioness, from Hugh Fearnley-Whittingstall’s vegetarian cookbook River Cottage Veg. These ideas are helpful to making the dinner table more exciting, especially this time of year. Because the other eater at my house doesn’t enjoy the flavor of curry, I limited by choices to two of the recipes. I also threw in a makeup. In no particular order, here’s my review. The first thing I made was the Rutabaga (Swede) with Onion and Sage. Cubes of rutabaga are slowly sautéed with onions, which caramelize during the long cook. 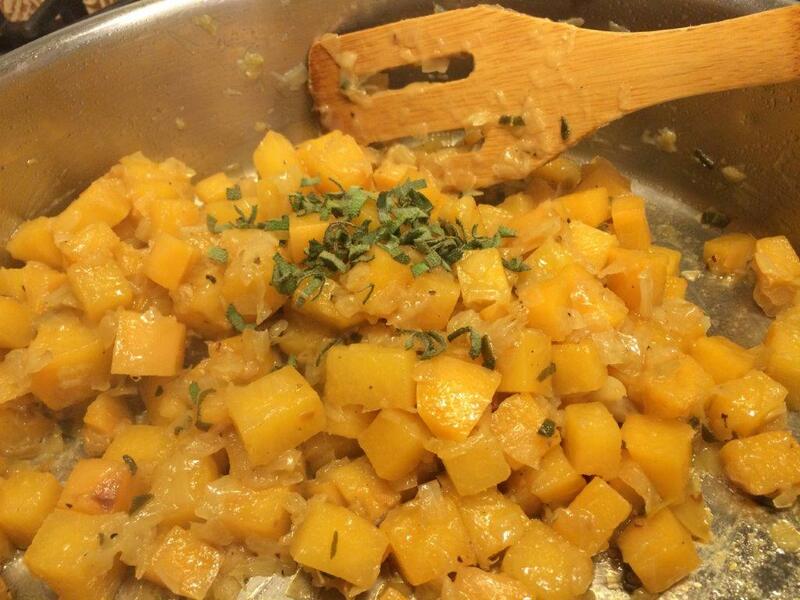 Once the rutabaga is tender, the dish is strewn with chopped fresh sage. I’ll admit that I struggle to enjoy this particular vegetable (turnips, too). Though the onions were sweet, the rutabaga itself didn’t sweeten quite enough for me. Roasting does a better job of that. I did like the flavor combination, so perhaps I would add onions when next roasting rutabaga and finish it with sage, being inspired by Hugh’s recipe even if I don’t repeat his version. Next I tried Squash Stuffed with Leeks. 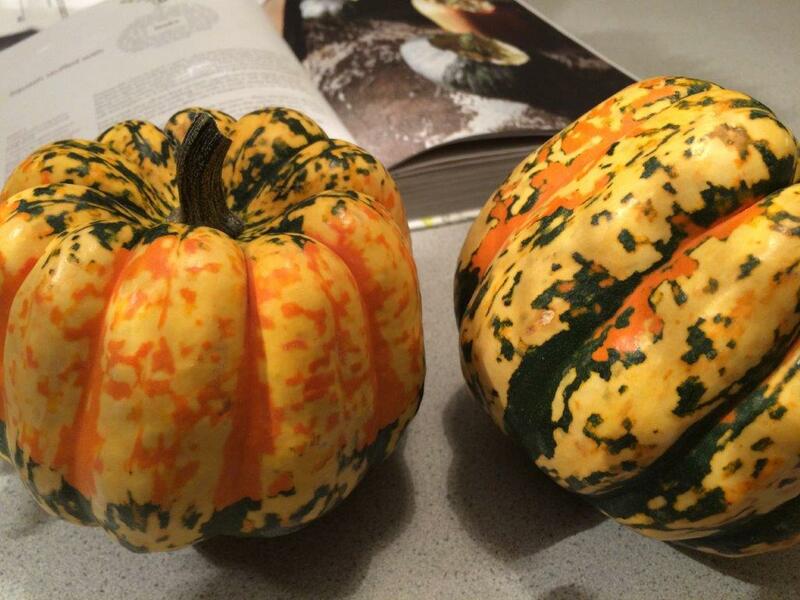 The problem with winter squash is that sometimes it’s sweet and flavorful, and other times it’s bland and mealy. There doesn’t seem to be any way to tell just by looking at the vegetable. I had some dumpling squash that I’ve been storing since late fall. Unfortunately, it fell in the bland and mealy category. On the other hand, the leek filling was delicious! It reminded me of the topping for leek and cheese toasties that we made back in August. 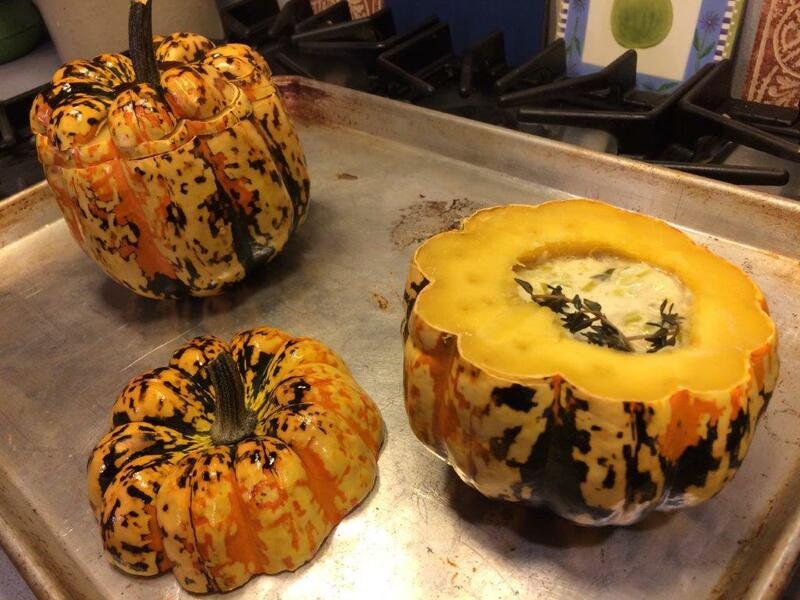 The filling didn’t turn the stuffed squash into a hit, but it did make the whole thing edible. I was disappointed that the squash didn’t pull its weight. I may try this again some time, or try to figure out something else to stuff. I can’t blame Hugh’s recipe for my mealy squash. Certainly, the presentation was pretty even if the overall taste didn’t match up. 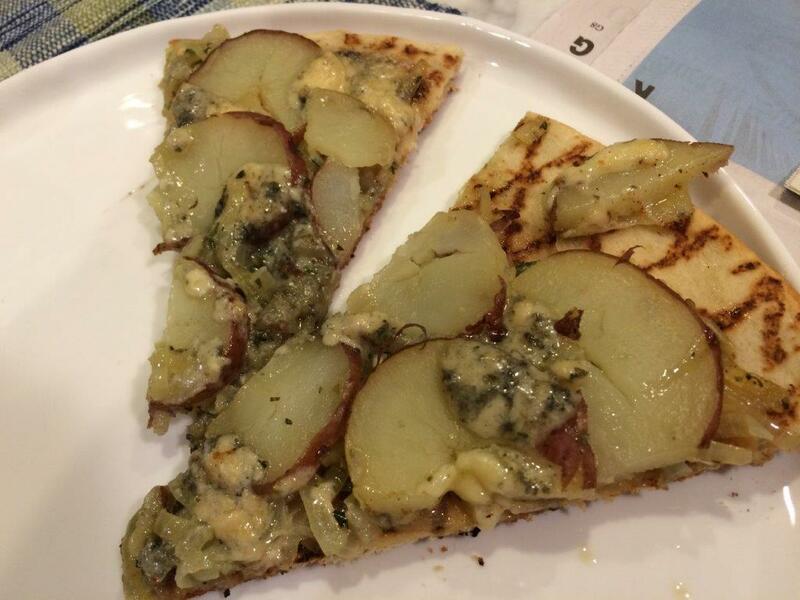 Finally, I made the Pizza with New Potatoes and Blue Cheese, a choice from June 2014. One of the supermarkets near me sells frozen wood-fired pizza crusts. I used one of these rather than making my own crust. If you plan ahead and have the ingredients on hand (cooking the potatoes ahead of time), this pizza accompanied by a green salad is a quick and delicious weeknight supper. The caramelized onions with garlic and rosemary provided a sweet foundation for the bland potatoes and piquant blue cheese. I enjoyed Hugh’s version of white pizza (i.e. no tomato sauce). February’s vegetables at the market won’t be much better than January, so I’m looking forward to Andrea’s choices for next month to liven things up. In the meantime, check out my fellow Cottage Cooking Club member’s blogs to read their reviews of January’s recipes. Maybe you will be inspired too! Spring is in full force, both outside my window and, courtesy of this week’s French Fridays recipe, in my kitchen. Leeks vinaigrette with mimosa is an easy salad with a perky mustard dressing that says, out with the heavy fare of winter, and in with lighter foods. The recipe calls for baby leeks, but they were nowhere to be found around here. I used a bunch of the smallest leeks I could find, though they were still pretty large. 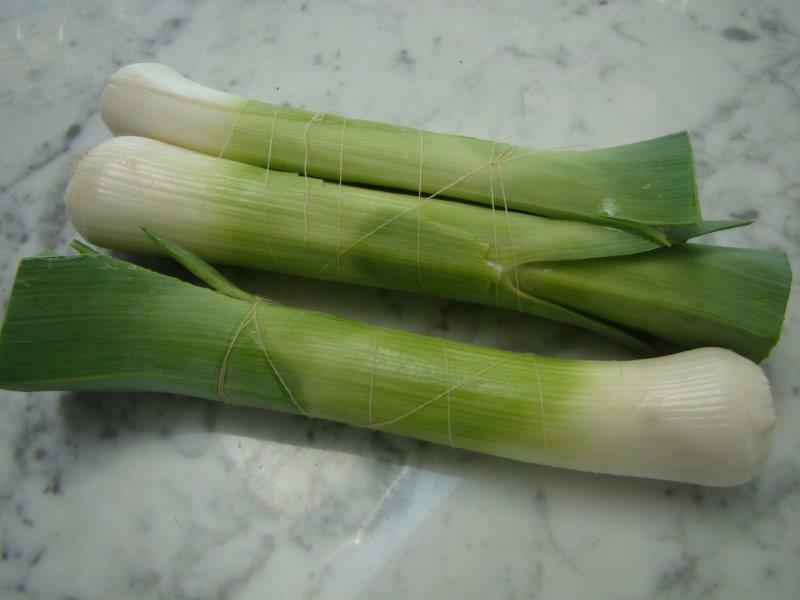 The leeks are partially split in order to wash out the dirt between the layers, then tied back together (out of kitchen string like I was? Use some white thread instead) before simmering in water until tender. For my medium-sized leeks, this took about half an hour. While the leeks cook, there’s plenty of time to make a hard-boiled egg and the aforementioned perky dressing which includes the fancy touches of sherry vinegar and walnut oil. We have an ongoing discussion in my house on the best way to make a hard-boiled egg. Does one boil the water before adding the egg or does one start the egg in cold water? There’s also the question of whether to cook the egg in boiling water or to to just let it sit in the boiled water. Opinions in cookbooks and the internet are all over the map. The method I’ve settled on is to start the egg in cold water, bring it to a boil, then remove the pot from the heat and let it sit for a certain amount of time depending on the size of the egg (15 minutes for a large egg) before cooling the egg in an ice bath. What’s your favorite way? I’m curious. 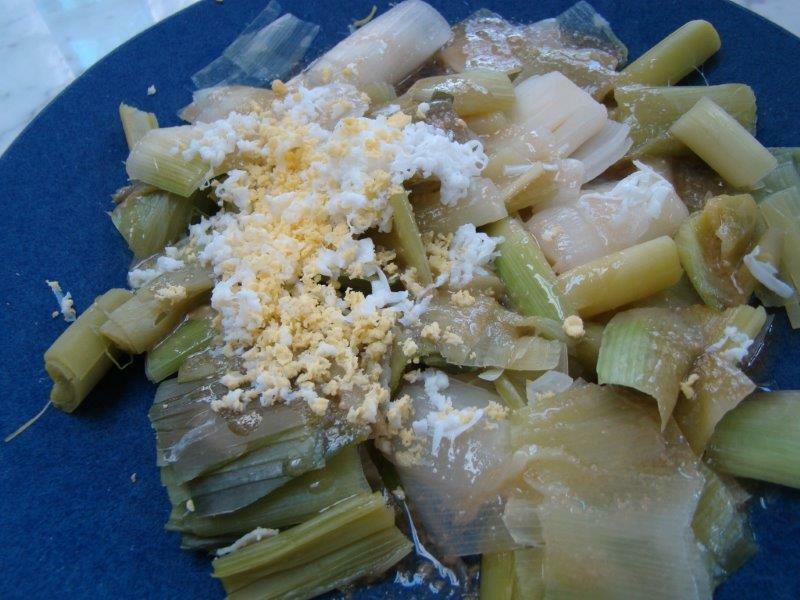 After the leeks are tender and dried off with a kitchen towel, they are sliced into thick (1-inch) slices, doused in the vinaigrette and topped with grated hard-boiled egg, which mimics the fringy fluffy mimosa flower. This was a delicious side dish, which I served somewhere between warm and room temperature. I was indifferent to the egg garnish. It was pretty, given that the cooked leeks weren’t the most attractive color, but the taste of the egg didn’t come through to me. Though enjoying this in the warmer weather, I could imagine serving this when winter is dragging me down to remind me that spring will come some day. If you’d like to know what my Dorista friends thought of their leeks, you can check their links here. The recipe can be found in Dorie Greenspan’s book Around My French Table. 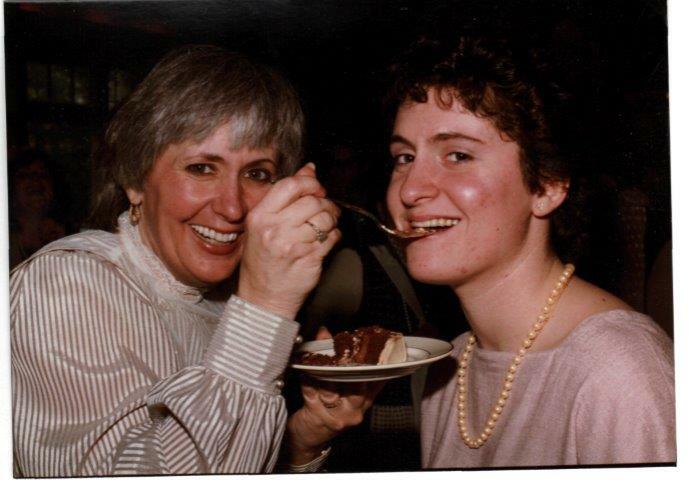 Since I lost my mother in 2007, Mother’s Day is an odd day for me. Though I have fabulous special “mother figures” to honor in my life (a stepmother, a mother-in-law, and an aunt extraordinaire), I now feel something missing. Being childless, I’m not anyone’s mother either. I’ve taken to thinking of Mother’s Day as a day to celebrate all the women in my life, family or friends, independent of motherhood, because these are relationships that enrich my days. So, from me to you, Happy Mother’s Day to all!